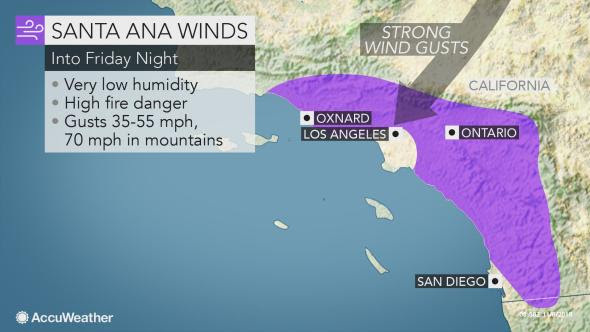 As a strong Santa Ana wind event continues in Southern California, evacuations are mounting in Ventura and Los Angeles counties as a pair of life-threatening wildfires rage. The Hill Fire is the largest of the two blazes, charring at least 10,000 acres since igniting in the area of Hill Canyon on Thursday afternoon. The fire is burning in the same area as the Springs Fire from 2013, according to the Ventura County Fire Department. The second blaze, the Woolsey Fire, flared up south of Simi Valley on Thursday afternoon and rapidly spread on Thursday night. It has burned 8,000 acres as of early Friday morning local time. The Woolsey Fire has burned multiple structures and forced the evacuation of all of Oak Park, a town of nearly 14,000 people. About 30,000 homes face a threat from the Woosley Fire, with multiple structures already damaged or destroyed, according to the Ventura County Fire Department. Ventura County fire officials said Friday morning that the blaze had jumped Highway 101 near Chesebro Road. Mandatory evacuations expanded into Thousand Oaks and part of the Los Angeles city limits. On Friday morning, officials issued a mandatory evacuation for all of Malibu, all areas south of the 101 Freeway from Ventura County to Las Virgenes and Malibu Canyon. Residents were told to use the Pacific Coast Highway. The Los Angeles Police Department said on Twitter that they are on a citywide tactical alert to ensure all resources are available to assist in evacuation orders and road closures due to the Woolsey Fire.